A sweater bag can be a jazzy fashion statement. Just looking at these bags can make you feel warm and cozy. But, buying a sweater bag—or several if you decide you want more than one—can set you back quite a few dollars. Instead, turn your old sweater into a bag or tote. Scouring department stores or online retailers for just the right sweater bag can be a hassle, and it's sure to be expensive. You already know that your old sweater matches your preferences; after all, you bought it in the first place. Don't throw it away: Follow the steps below to create your own ​DIY sweater bag or tote—for free. If you've chosen to work with a wool sweater, felt it before continuing. This will add strength and beauty to the fabric. Felting Instructions: Wash your sweater on the hottest washer setting and dry it on high heat. This should cause the fabric to take on a soft, fused texture. If you can still see the weave in the fabric, it's not fully felted. Repeat the process until you get the desired results. Lay the sweater out on your work surface, and cut a straight line across under the armpits to divide the sweater into two parts. Set the top portion of the sweater aside for use in a later step. For now, you'll be working with the bottom portion of the sweater, which will serve as the body for your sweater bag. Smooth out the bottom portion of the sweater, making sure that the bottom edge of the sweater matches up front and back. Then, stitch across the bottom—about 1/2 inch in—to create a seam for the sweater bag. If you'd like a pocket on your bag, you can create one from the neckline of the sweater. Simply cut a rectangular patch from the neckline, center it on the bag, and stitch it in place. Create a lining for the bag by sewing a fabric pouch that is just slightly smaller than the exterior of the bag. Then, pin it in place. Be sure to sew the pouch with the good side of the fabric facing in. Hem the top of the sweater bag to create a nice, finished edge. 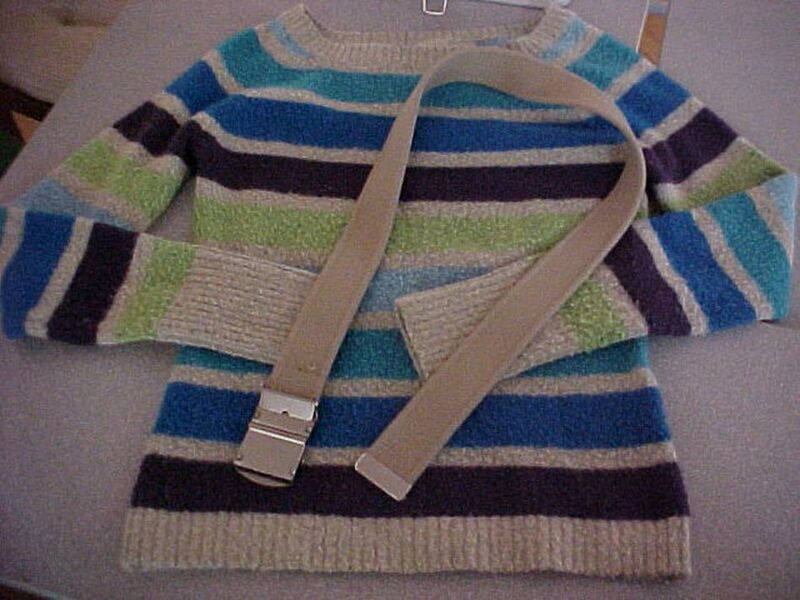 Create handles for the sweater bag by cutting an old, cloth belt in half and stitching a handle on each side of the bag, or do the same with two pieces of decorative ribbon. To keep the ends of your handles from unraveling, apply a bit of super glue to each one.